I like IKEA. Here in Hong Kong, I reeeeeaaaally like IKEA. Hong Kong has some ridiculously overpriced homewares. IKEA though, is consistent with its quality, design and realistic prices. It is pretty much universally known. My clients are nearly always on a tight budget so IKEA is a favourite of mine. 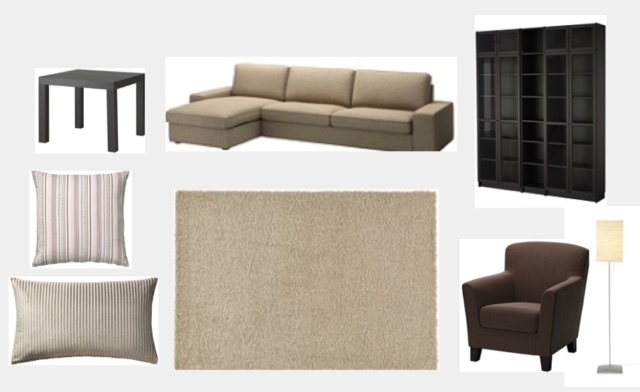 When I started to plan this post I had originally planned to do a post on my favourite IKEA pieces. Over the years I have read a few articles by various people on their “Top Ten IKEA Faves”, etc etc. Then I thought about the experiences I am having with my clients and the type of IKEA they usually buy (and that I have to work with!). IKEA has some great pieces, but for some reason most people tend to go for the dark chocolate brown furniture that was really popular 10 years ago. They pair it with a beige sofa and a beige rug and cream cushions. Unsurprisingly, all these “safe” choices combine to make a room that is lacking in personality. Is this awful? Nope. But is it beautiful? Can you get any hint of what the person who lives in it might be like? Is there anything that engages you here? Nope. This is the point that I come in and have to inject colour and shine and create something that better reflects the homeowners life and loves. So I thought to myself, rather than coming in at the end of this, what if I could avert even one brown-out (that sounds grotty doesn’t it?!) and show a couple of ideas for what is possible for a room, EVEN IF YOU ONLY SHOP AT IKEA. Now, this is a challenge. Doing an entire room from any one particular store is hard. Doing it with IKEA where half of what is on offer is cheap crap makes it a really mentally invigorating exercise. 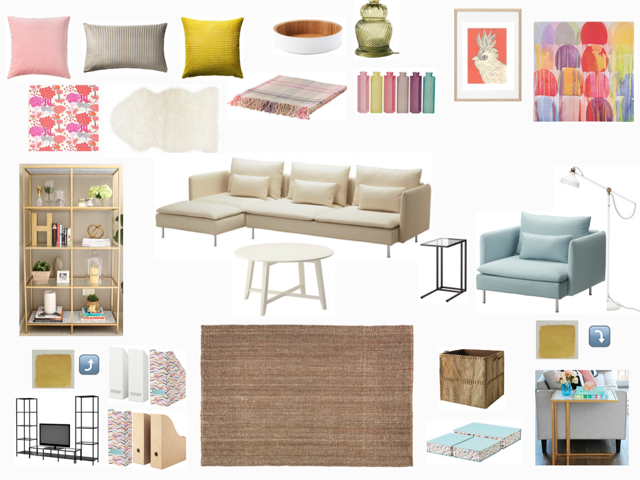 So I set myself the challenge: create two design boards for lounge rooms that have completely different looks but that are 100% sourced from IKEA. Not a single thing could come from another source. In my mind, my client was someone who has moved to Hong Kong with no furniture and has to buy it all in one fell swoop and has only got an IKEA budget to spend. I started with some of my favourite pieces that I knew I wanted to include in the designs. The Stockholm range are by far my favourite pieces at IKEA. The quality is a notch above most of the other ranges and it reflects my personal design preference for natural timbers and clean, elegant lines. 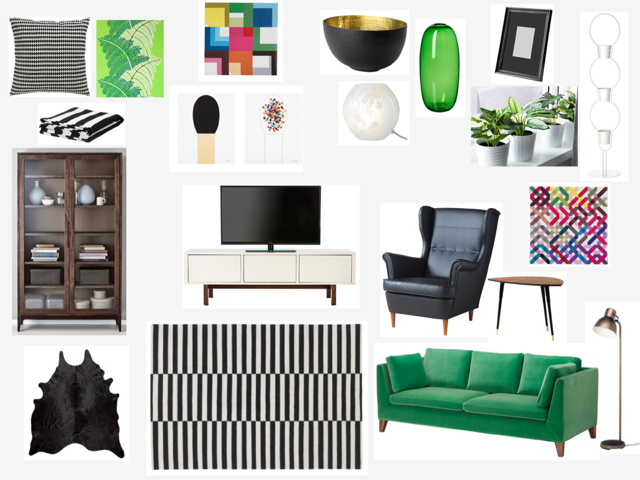 I really wanted to use IKEA’s infamous striped rug from the Stockholm range (it tops almost every list of “great IKEA finds” for good reason!) because I have not yet had a client to use it for. I also wanted to use the new-ish Regissor bookcases that have a great natural wood finish. The biggest challenge was by far in lighting as nearly all of IKEA’s lighting is just awful. It looks and feels cheap. They are mostly wobbly lamps that are the same range that they had 20 years ago. There are a few exceptions (which are obviously the ones I used!) but let’s just say it’s lucky I wasn’t doing three different boards or I would have had to double up my lighting options…. I created two distinctly different rooms: one a vivid, graphic palette of black, white, walnut and emerald green. The other a soft, pastel palette of white, gold, blue, pink and yellow. I did cheat the tiniest bit on this second one as it involves an IKEA “hack” of spray painting the IKEA Vittsjo pieces gold. Would it work still if you didn’t? Well, yes. But the gold would be so much better. And I say this as objectively as a person with an obsession with gold home wares can! So for anyone out there who is moving to Hong Kong without a stick of furniture, here are two choices for creating a lounge room sourced solely from IKEA. So what do you think? Would you be happy with either of these as your lounge room? I tried to not have the rooms look really “IKEA-ish”. Not sure how to describe that any clearer, but you know when you see a room and it just looks like you are in the IKEA showroom? I wanted these to still represent my own style, but just using IKEA things. Hard to do when they don’t have much gold in the store…. or animal print, antiques, gold, agate, marble, or gold. Tough choice to pick my favourite. Leaning toward pastel but both are great! Fantastic project. Well done-gold star.